A passionate group who truly perform a labor of love each day to ensure the best interests of all the children and teens we serve. Click on each picture to learn more about our staff. 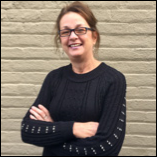 As Administrative Assistant, Donna provides support for the Executive Director, all office staff, and Board members. She joined the CASA staff in November 2018, previously working as administrative support for 4 years at Big Brothers Big Sisters. Donna is proud to "continue to serve an organization committed to acting on behalf of the best interests of children in need."